A historic link to the remote island archipelago of St Kilda has been restored with the launch of a new boat service from Uig in the Isle of Skye. Visitors will now be able to sail from Uig to St Kilda with a journey time of just over 4 hours. St Kilda is the most remote part of the British Isles, lying some 44 miles from Benbecula in the Outer Hebrides off the west coast of Scotland. The largest island is Hirta, which has the highest sea cliffs in the UK. 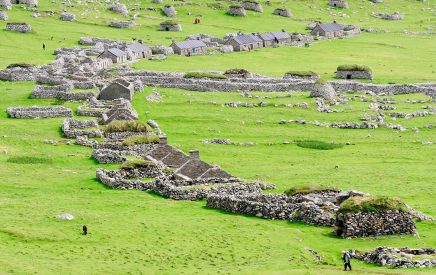 St Kilda was inhabited until the mid 19th century, when the hardships of life in such a remote outpost took their toll and many islanders emigrated to the New World. The population went into decline, and food shortages were common. Feelings of isolation increased during the two World Wars, and finally in 1930 the remaining 30 islanders requested evacuation to the mainland. Today you can still see the remains of human inhabitation on the island, including houses, stores, bothies and burial sites. There are impressive cliffs and sea stacks, and St Kilda is home to over half a million breeding sea birds including the world’s largest northern gannet colony of over 60,000 birds. Blue Badge for Highland Trails!